My first and favorite option is to simply snuggle, and it really does warm up dogs quickly. Since Charlie is 70 lbs, and both of us can't fit in the sleeping bag at the same time, what I will do is put a blanket over my thermarest and lay on top of then. Then, I will unzip my sleeping bag, and put that on top of us like a large blanket. That way he can snuggle me, he's on top of insulation, and we are both under the sleeping bag. This always seems to work the best for him to warm up. 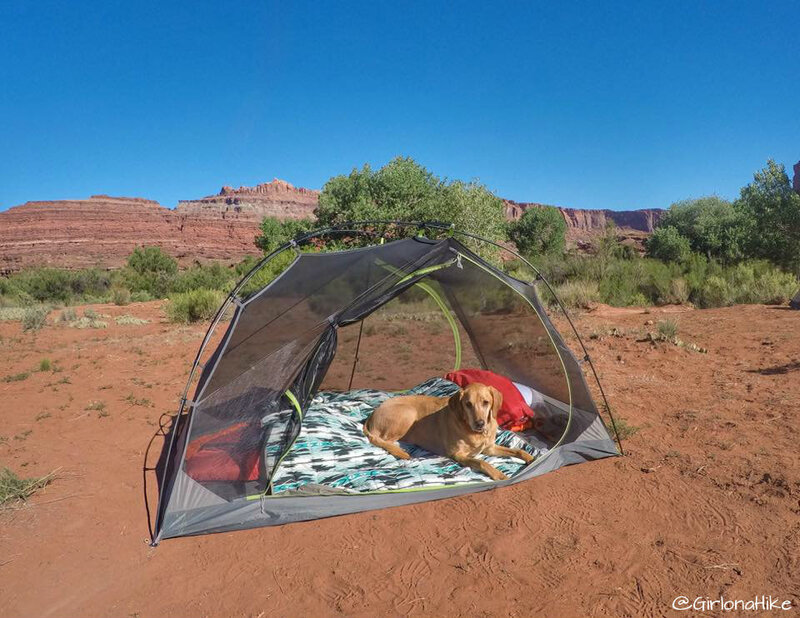 Several companies now offer a dog sleeping bag, such as the FrontPet Dog Sleeping Bag or the ChuckIt Travel Bed. 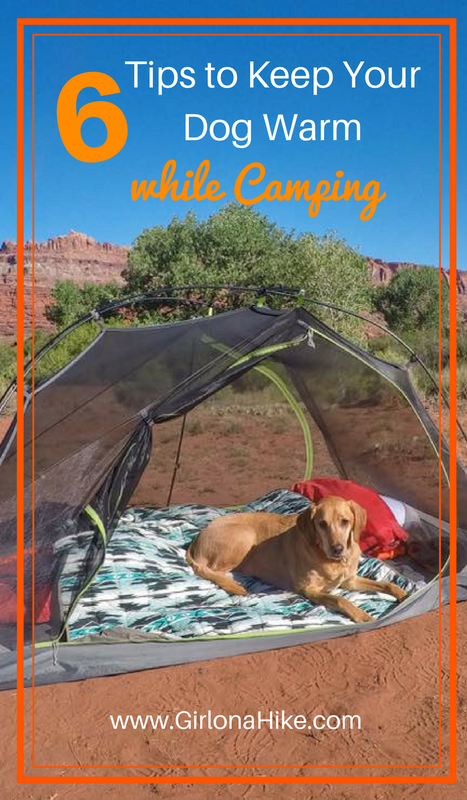 They have a durable, polyester outer shell that provides a water-resistant, quick-drying layer to ensure your dog will stay warm and dry in tough conditions! 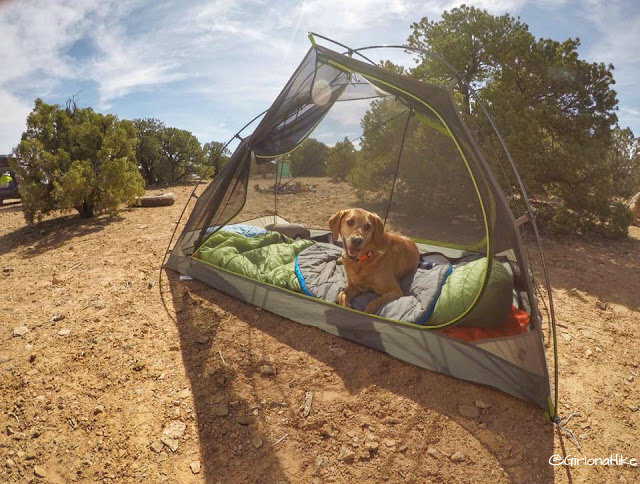 Dog sleeping bags/pads are compact and weigh under 2-3 lbs. 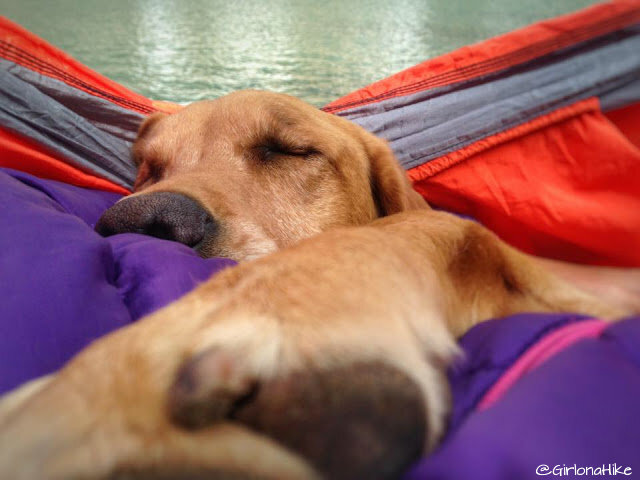 Just like a human sleeping bag, your dog can curl up in between two layers of their own bag to create warmth from it's own body heat. When temperature drop at night, or even after a storm passes through, I like to put a lightweight puffy coat on Charlie. 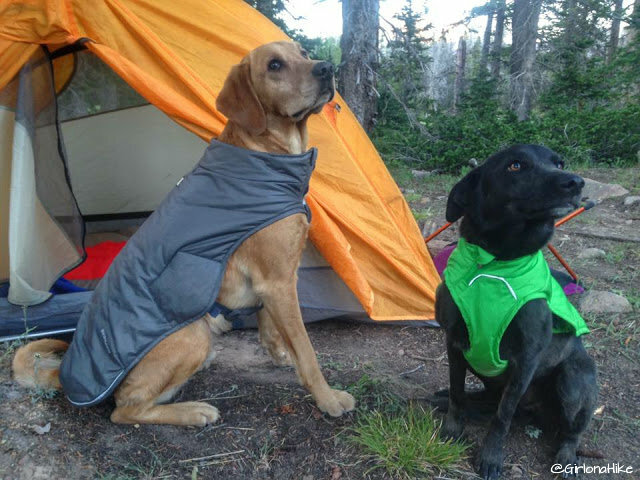 Ruffwear makes an awesome coat called the Quinzee Coat that is perfect to warm up dogs. Other companies have variations of a dog coat, but this one is made of synthetic down, making it warm yet light. 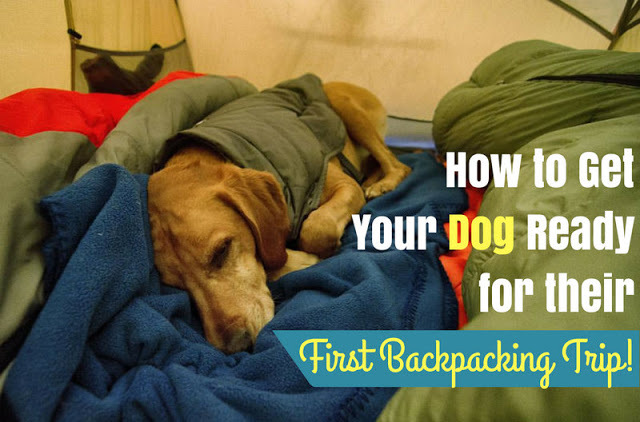 This jacket also rolls up into the built-in stuff sack so it takes up less space in your backpack or dog pack. Side buckles ensure that the coat stays on all night long. If your dog is physically shivering, another option is to create a hot water bottle that should be wrapped in a shirt or packtowel, then place it next to your dogs as they curl up. 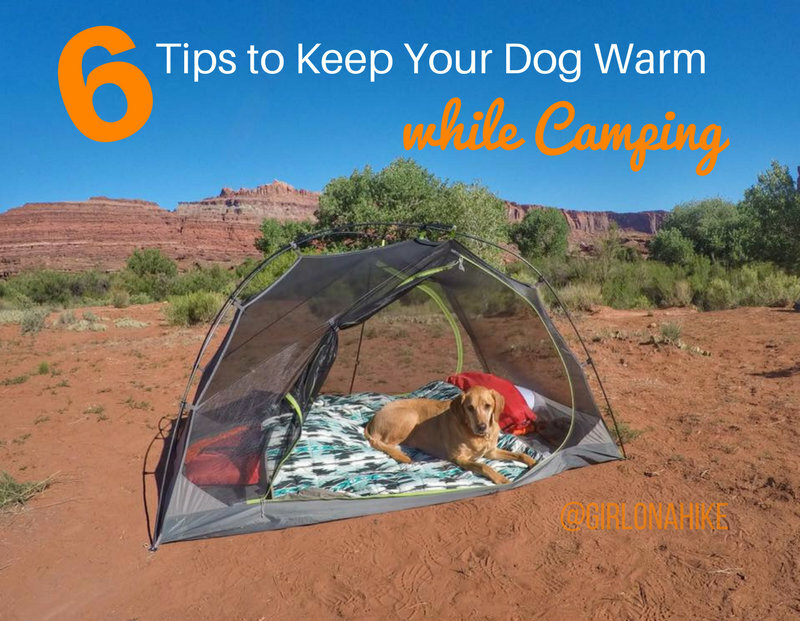 Simply boil water, fill up a Nalgene bottle, wrap it in a shirt or towell, then place next to your dog. Always test the water bottle against your own skin - if it's too hot for you, then it's too hot for your dog. When I backpack with Charlie, I take a think piece of either a fleece blanket or lighweight down blanket with me. People immediatly ask, "Well, don't his nails tear it?" Nope. He knows that this blanket means it's time to sleep and no playing is allowed on it. It took some training, but he got used to the new rules. Not only can this be used as a blanket for insulation for if someone gets cold during the day, but like humans, dogs need a layer of insulation to bed down at night. A large enough fleece can be folded several times to create more layers, depending on how much padding your dog needs. 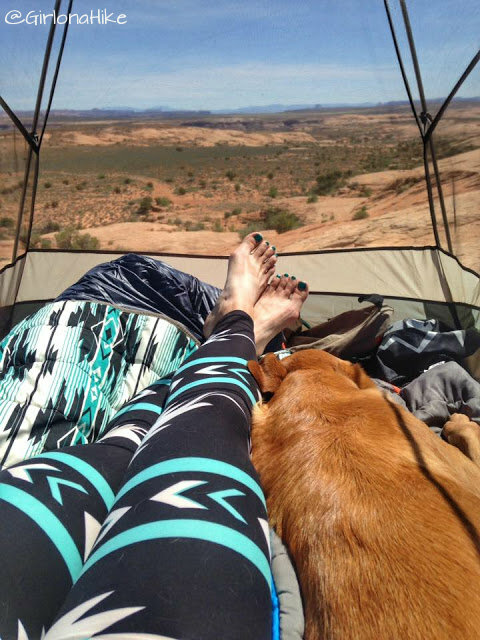 Fleece or down blankets are great becasue they are light, can roll up easily, they are affordable, and can usually fit into the top lid of your backpack and provide a special spot for your dog to sleep at night. Tip: If you shop at CostCo, they will offer the Double Black Diamond Packable Throw for only $20 in the Fall/Winter! Online they offer this blanket for a set of two for $40 but they have fewer color options. 6. Cuddle your bestie If you have two dogs, have them sleep next to eachother! What better way to warm up next to your bestie?? 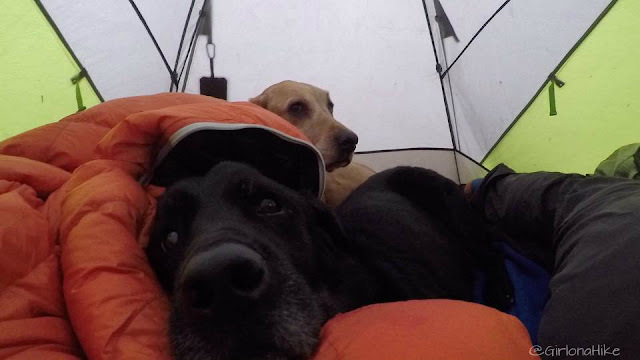 Charlie's buddy Bear backpacked with us for three trips, and each night they cuddled up to keep warm, and I also put the sleeping bag on top of all of us. It was pretty toasty! How an Adventure Dog will Change your Life...Forever! 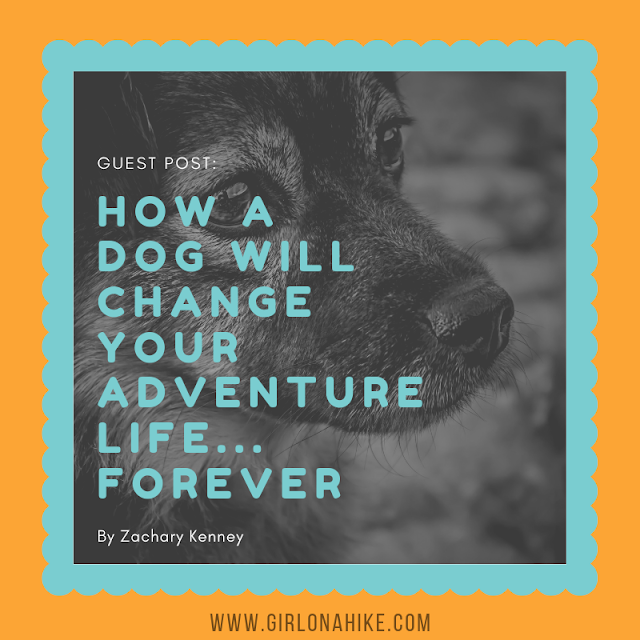 Share me with other dog parents! Thanks for these tips. We will be taking our dog camping this fall for the first time and I wasn't sure about her at night when temps drop low. I was just at Costco too looking at the black diamond fleece and deciding how well they really would pack down! Great tips! I've just started camping with my dogs and this is really helpful. We tried car camping first and our next step is backpacking so I'll be deploying a lot of these! Do Charlie and Bear react the same to the cold? My husky mix insisted on sleeping on top of the sleeping bag, while I had to bring my pit bull mix underneath and snuggle her because she was shivering.